To group data into categories, the researchers first divided the globe into 50 distinct land regions. Each region contained 11 of the most similar climatic ecosystem and topographic characteristics. Graphic courtesy of the author and PNNL. The Earth's soil, along with its oceans and lakes, are vast lungs, taking in and breathing out gases that interact with the atmosphere. Part of that breathing cycle is the carbon dioxide produced when organisms in the soil and water respire. This heterotrophic respiration (HR), the work of both animals and microbes, is a major part of the "carbon flux"—the dynamic breathing cycle—between ecosystems and the atmosphere. Most carbon fluxes can be measured at the large scales useful to global Earth System Models. But HR, despite its great importance to the planet's carbon cycle, cannot be directly measured at scales larger than a relatively small chamber. For spatial domains larger than about a square meter, HR must be either computed as a residual, estimated from statistically-upscaled point measurements, or derived using models with little ecological or biological process-level fidelity. This means HR comprises a large and relatively uncertain component of the carbon cycles that affect ecosystems on a global scale. A new "Innovative Viewpoints" paper in Ecosphere, by researchers at Pacific Northwest National Laboratory, Oak Ridge National Laboratory, and elsewhere, suggests a way to improve the situation. A DFT scheme, they argue, would "abstract and capture" important differences in HR metabolism and carbon flux dynamics. In turn, experimentalists would "group and vary" DFT characteristics across space and time. At first these characteristics would be outlined by top-down expert opinion; but soon, the researchers say, DFT characteristics would be developed and assembled using bottom-up analyses driven by data. To illustrate DFT development in action, the researchers used an example-clustering analysis to experimentally group data into categories. (Statisticians use this technique as a way to identify underlying groups within data, without the need for an explanation.) Annual HR, they showed, can be broken into distinct groups associated with global variability in biotic and abiotic factors - that is, in both the living and non-living parts of the ecosystem. The same analysis demonstrated that DFTs are distinct from (but complementary to) existing PFTs. The paper provided this quantitative case study, then suggested next steps and priorities. Why It Matters: The global Earth system models used to predict the future climate and carbon cycle are very sensitive to changes in HR. But climate scientists have little confidence that such models do a good job in representing this important component of the carbon cycle. So the paper proposes DFTs as a new approach, an "intermediate step," that has the potential to allow models to make much greater use of observational data. That would bridge the current gap between measurements and models, the researchers argue, and improve models significantly. If DFTs turn out to be "conceptually solid, operationally tractable, and effective in improving large-scale HR predictions," the authors say modelers could work out how to incorporate them into Earth systems models. Methods: Researchers presented an example: a cluster analysis to show how annual heterotrophic respiration can be broken into distinct groups—that is, groups associated with global variability in both biotic (living) and abiotic (non-living) factors. Their analysis used 11 global characteristics related to climate, soil, modeled HR, and GPP, which is the gross primary production of organic compounds from carbon dioxide in the air and water. Cluster analysis produced 50 unique clusters, or DFTs, that partitioned regions based on those characteristics. What's Next? Developing DFTs will provide testable hypotheses for a wide range of field, laboratory, and modeling experiments. This "Innovative Viewpoints" paper aims to build a foundation for DFTs in global models, and so provide the ecological and climate change communities with robust, scalable estimates of heterotrophic respiration. Once they are rigorously defined, DFTs would be a "first approach" to improving model representation of decomposition processes, researchers say. Next steps would also include collecting and synthesizing existing data; doing more in-depth analyses that combine open data with rigorous testing of analytical results; and using point measurements and realistic forcing variables to constrain process-based models. 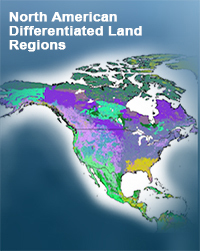 Sponsors: The U.S. Department of Energy Office of Science, Office of Biological and Environmental Research for the Terrestrial Ecosystem Sciences and Regional & Global Climate Modeling programs, the U.S. Department of Agriculture, the U.S. Geological Survey, and the National Science Foundation. The JGCRI is a partnership between PNNL and the University of Maryland. Research Team: Ben Bond-Lamberty, PNNL; Rodrigo Vargas of the University of Delaware; Daniel Epron of Université de Lorraine; Jennifer Harden of the U.S. Geological Survey, Menlo Park. Calif.; Mark E. Harmon of Oregon State University; Forrest Hoffman and Jitendra Kumar of Oak Ridge National Laboratory; and Anthony David McGuire of the U.S. Geological Survey, University of Alaska Fairbanks. Reference: Bond-Lamberty B, D Epron, J Harden, ME Harmon, F Hoffman, J Kumar, AD McGuire, R Vargas. 2016. "Estimating heterotrophic respiration at large scales: challenges, approaches, and next steps." Ecosphere 7(6). DOI: 10.1002/ecs2.1380. Click here to learn more about our research in this area.